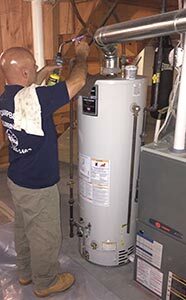 When you need water heater repair in Webster, NY, give G.T. Campbell a call. We are your experts in all things pertaining to your water heater, and we know you need your hot water restored, fast. We’ll come out when it’s convenient for you, take a look at your heater, and let you know what needs to be done to get it fixed. When your hot water goes out completely, it’s pretty clear that you need to call someone to take a look at things. Sometimes, though, your water heater will give you some signs that it is struggling before it breaks completely. Here’s what you can look for. Loud bangs from your water heater. Most of the time, your water heater should work quietly. When it starts banging or clanging, this is an indication that something has gone wrong. Your hot water doesn’t last as long. Do you feel like your hot water used to last longer, or you used to be able to do several things that require hot water at once, and now you can’t? Give your trusted plumber in Webster NY a call and we’ll let you know what’s going on. Your hot water is lukewarm. If your water heater can’t heat the water as well, it’s time to have it checked out. No matter what you need for water heater repair in Webster, NY, we’ll take a look and give you an honest opinion. Then, we’ll get your hot water running again.